Show off your menu items! 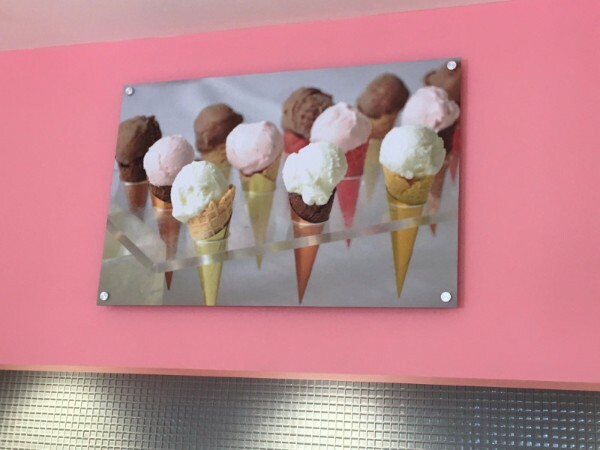 The displays on these panels feature high-definition images of ice cream products. We used stock photos for the job and finished the panels with a matte laminate. Doing so prevents sun and artificial lighting glare, which makes it easier for guests and passersby to see the appetizing dessert displays. Also, the laminate makes cleanup a snap. Because the image backgrounds feature primarily neutral colors, they look fantastic on the walls that present different color schemes. 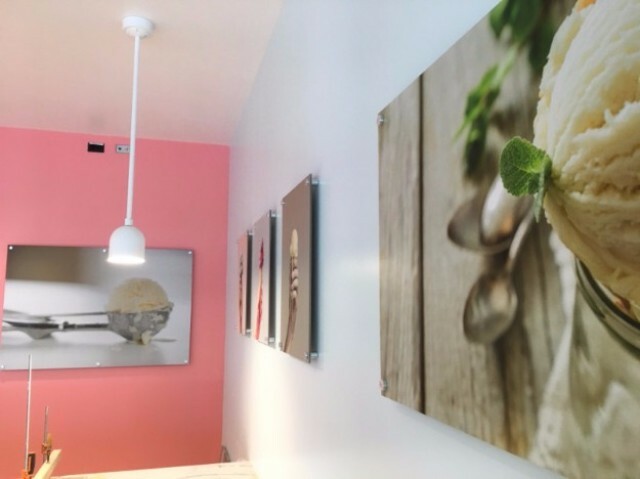 Flawlessly mounted by our installers, these products now set the tone for a welcoming atmosphere at the Scoops Ice Cream Shop’s latest location. Invite the hungry in with mounted prints! 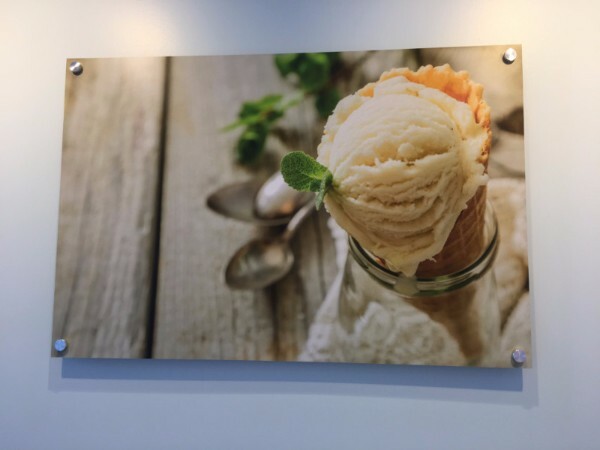 Whether you operate an ice cream shop, a bistro, an all-night diner, or an upscale restaurant, you need artwork to set the mood inside your venue. Doing so is of particular importance when businesses around you feature different types of atmospheres. Standing out and helping the consumer to become part of your dining experience relies on the right, ambiance-setting décor pieces. There are several options open to you. Imagery will make visitors order your specialties! Wall wraps. Treat the walls of your setup with a mural-quality display. 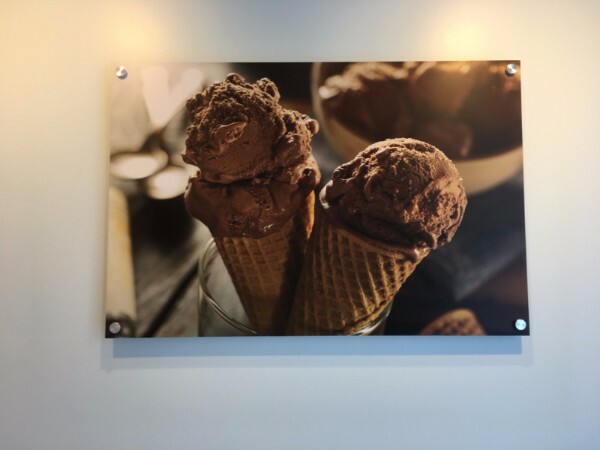 Whether you operate inside a food court or out of a stand-alone restaurant, wall wraps have the power to make a huge difference in the way a setting appeals to the guest. The combinations of colors and images, as well as the overall scenery, have a tremendous impact on the consumer’s ability to enjoy the meals – and come back for more. Wall graphics with a window lettering tie-in. Some clients choose to feature graphics instead of murals or custom printed wallpaper. To create an expectation in the guest’s mind, they feature specific messages as window lettering. On the inside, the graphics are the response to this information. Another good product solution on the interior is corresponding wall lettering that echoes the window-mounted messages. Ready to hang menu items on your walls? Whether you plan to use stock images or photos that you took yourself, selecting high-definition products is essential. 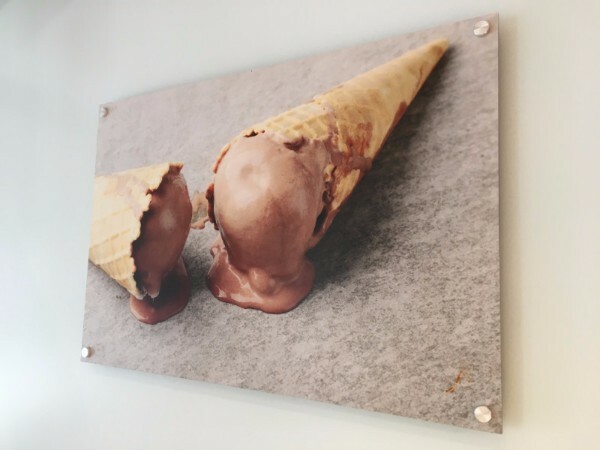 They look better on your walls, create a fantastic backdrop for your order counter, and set the tone for the guest’s experience. Contact our graphic artists today to learn more about your options and to put in your order!